Yeah, my eighth grade self apparently didn't understand the definition of "getting it on" until I'd told half the school I was doing it. As a public relations major and advocate for the importance of relationships, I believe in the power of communication, especially when it's done right. However, I understand how easy it is to misspeak or misunderstand. I understand how frustrating it can be. However, I believe we need to be mindful in our interactions because so much can be misunderstood and even harmful, with the potential to hurt both personal and professional relationships. One of the main instances that comes to mind for me goes back to eighth grade when I told all of my girlfriends that this guy and I were "getting it on," thinking that meant flirting. Yikes. I still simultaneously awkwardly laugh and cringe years later. And then there's that time in high school when everyone in the student section of football or basketball games would should out random insults to specific players, and I tried to be ironic and yell out a random compliment, except "artistic" sounded like "autistic" to my best friend beside me, who glared at me without my understanding why. Yeah, that took a lot of explaining. Even when we feel we're being so clear and so obvious and so intentional, we aren't always received that way by the other person. For those of us with anxiety or depression, we sometimes doubt what our friends say or feel we aren't worthy of their compliments. This is something we need to keep in mind as friends of those people and for ourselves. It's also important to understand your loved ones' love languages, in which you can take the test here. My main love language is words of affirmation, so I basically need you to tell me how great I am and how much you love and appreciate me all the time. 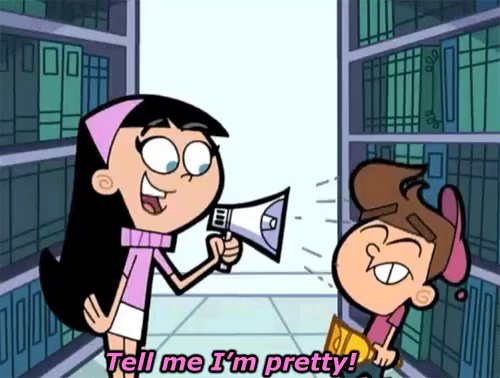 I'm lowkey Trixie Tang, but it's fine. But the thing is, that's not everyone else's love language. We have to keep that in mind when we're giving and receiving love with other people. I know my friends love me when they're not actively affirming me and when they're showing love in other ways, like quality time. And even though I don't walk around complimenting my friends all the time, I love them all the same. We need to strive to be mindful in our conversations with other people because our word choice matters more than we may realize. For example, I try to grab the attention of groups of people by saying "Hey y'all" or "Hey everyone" rather than "Hey guys" if I'm not talking to a group of guys because I don't want to exclude women or nonbinary folks. I also would rather be called a survivor than a victim, but I understand that some people prefer victim. In one of my organizations, we have to be mindful when we use the word "fat," because in the activist world we know it's important to reclaim the word and emphasize how it's not a bad thing, but a descriptor and macronutrient; however, we know that not everyone has had that experience or has thought about reclaiming it and that we are primarily people of thin privilege, though we welcome people of all sizes. Communication is undoubtedly tricky and nuanced, and that can be frustrating. We all make mistakes and have to learn. Communication is something we have to consistently work on because it's so important to our relationships, our roles as leaders and activists, as employees and more. Communication is the basis of everything, so let's work hard at it.